Áron Romhányi (b.1974) is Hungarian, living and working in Budapest and holding degrees in jazz piano and education. He has vast experience as a keyboardist, music director, pop songwriter, arranger, recording engineer, and producer. His collaboration, composing and performing worldwide, with tuba artist Roland Szentpali has resulted in four CD recordings as well as publications. 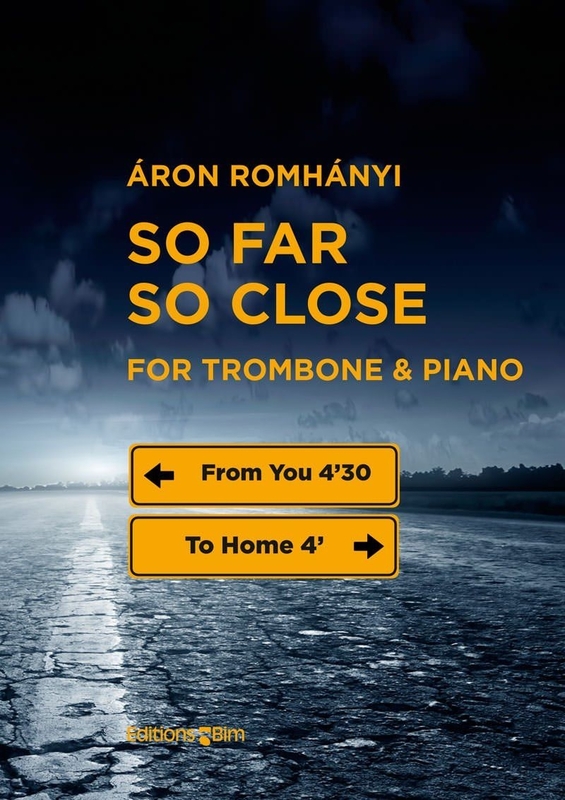 One of those CDs, Parallels, includes an excellent recording of So Far So Close by trombonist Robert Stürzenbaum. Ko-ichiro Yamamoto has also expertly recorded the work on his album Ballade (Cryston, 2011). The first movement, So Far, gives no tempo indication, only the direction Rubato. Smooth and easy listening are perhaps appropriate words to describe the musical style. There are a few measures with fast note embellishments and leaps, but the style is predominantly that of a fine jazz singer improvising. Advantageous in this movement is a Tommy Dorsey type approach to and control of legato. The harmonic structure is jazz infused. For the most part the piano, with the exception of an eight bar solo interlude, merely accompanies the trombone. The second movement, marked Vivo, with its syncopated dance like vamps in the piano, is often marked jazz style and requires control in extended registers. With the exception of some leaps, it is not overly difficult from a technical standpoint. This is music for an advanced trombonist, requiring an understanding of jazz phrasing, good flexibility, and control in a range that spans from GG-sharp to f2. As is the norm for Editions Bim publications, the paper quality, printing, and artwork are all first class.